Suit up with a selection of the coolest jetpacks ever made and take to the skies as Barry Steakfries, the lovable hero on a one-way trip to adventure! 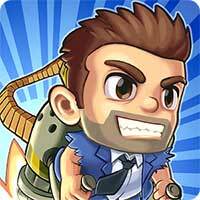 From the creators of the worldwide phenomenon Fruit Ninja comes the action-packed Jetpack Joyride, Halfbrick’s most anticipated Android game ever!Join Barry as he breaks in to a secret laboratory to commandeer the experimental jetpacks from the clutches of science evildoers. After lift-off, simply touch the screen to ascend and release to descend, raining bullets, bubbles, rainbows and lasers downwards as you fly towards higher and higher scores!